Thank you to everyone who participated in the recent Purina Animal Nutrition survey on equine nutrition and feeding programs. Over 400 PATH Intl. members generously took part in this data-gathering effort! A random drawing took place in May with winners receiving prizes from Purina Animal Nutrition. Five winners received a bucket of Freedom Flex Joint Health Product and 20 winners received three free bags of Purina Horse Feed. All prizes have now been disbursed. Purina will be reaching out to centers that expressed interest in discussing their feeding programs in detail. If you missed the survey but would like to connect with Purina to discuss your nutrition programs, please contact Megan Ferry or call her at (800) 369-7433, ext. 107. Thank you to all the participants! Scholarship Information - Deadline Approaching! Send your application in to apply for these two scholarships. 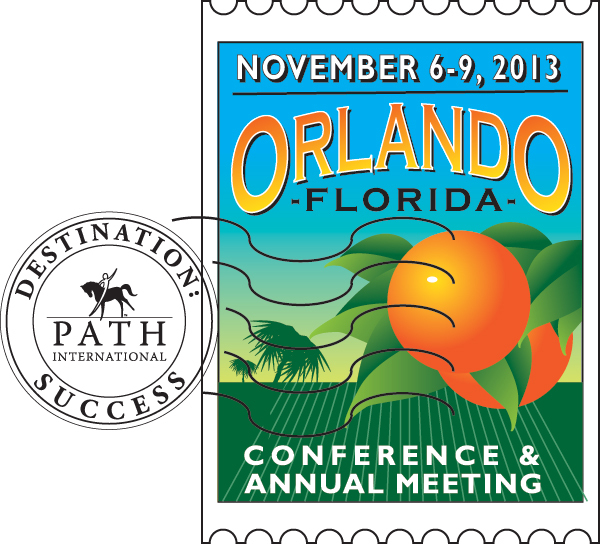 Thank you to the members who submitted nominations for the 2013 PATH Intl. Annual Awards. Many deserving equines, certified professionals, equestrians, volunteers and veterinarians were nominated this year. Award winners will be announced later this summer. Remember, nominations may now be submitted all year round. All nominations received after May 20, 2013, will be considered for the 2014 PATH Intl. Annual Awards. The 2013 Professional Association of Therapeutic Horsemanship International Standards for Certification and Accreditation is now available online and will soon be available in hard copy and CD. The new manual is effective July 1, 2013. Click here to download the manual; you must be logged in to your account on the PATH Intl. website. If you have any questions, please contact Corey Cambell or call her at (800) 369-7433, ext. 104. The Professional Association of Therapeutic Horsemanship International Standards for Certification and Accreditation is a document that is constantly evolving as the EAAT industry continues to grow and develop. Any new standards proposed or standards that are rewritten to the extent that the intent of the standard is altered are offered to the association members in the form of Field Test Standards for comment and critique. Traditionally, member input has been solicited only at accreditation site visits, regional conferences or the PATH Intl. Conference. In an effort to extend the opportunity for input to the members of the association, current Field Test Standards are now posted online in PATH Intl. Community Connections. All PATH Intl. members are encouraged to read and post comments on the current Field Test Standards. With strong member input, PATH Intl. will continue to lead in the promotion of best practices for safety and service in the industry. Final Days to Win a 2-Night Pick-a-Trip Package Through Member-Get-A-Member Contest! We at PATH Intl. know that our current members are the best possible source for new members who could benefit from all PATH Intl. has to offer. With our special Rein Them In Member-Get-A-Member drive, we've made referring colleagues to PATH Intl. easier than ever! Forward an application to them or direct them to the PATH Intl. store to join online. Ask your friend to enter your name as their "referred by." Then tell another friend... and another... and another to win prizes. Click here to learn more. We'd like to thank you for your efforts for all members recruited by June 30, 2013. Check out this center member benefit! Daily we are confronted with the fact that we live in a world of upheaval. Our centers have faced tornadoes, hurricanes, floods and fires. PATH Intl. can help member centers in good standing with an immediate need in funding expenses not normally covered by operating insurance after natural or man-made catastrophic disasters. Click here to learn more or to apply. Individual members also benefit from funding opportunities through the Pat and Jackie Mullins Conference Scholarship as well as other conference scholarships and the Instructor Certification Scholarship. PATH Intl. welcomes these centers who joined in May 2013! Shoes, shoe-less, hoof boots, trimmers, farriers, staff members, regular maintenance -- EAAT programs have many choices of hoof care practitioners and hoof care methods. Hooves are designed to thrive in their own ways. Consistently mediocre hoof care programs can be detrimental to the equine and cost-ineffective for a program. In designing a hoof care program tailored for the equines' well-being and program management, consider these suggestions: explore options of hoof care; try various methods per individual equine; monitor and document tries; and involve significant people throughout this process. Read more. Check out some of the latest discussions on PATH Intl. Community Connections. If your center offers equine-facilitated psychotherapy (EFP), are any of the activities mounted? Find out how other programs are utilizing mounted EFP activities in the PATH Intl. EFP Community. Do you have questions about whether your center is meeting a particular standard? Ask the experts in the PATH Intl. Standards & Accreditation Community. The Jockey Club Thoroughbred Incentive Program is now accepting applications for the T.I.P. Thoroughbred of the Year Award. 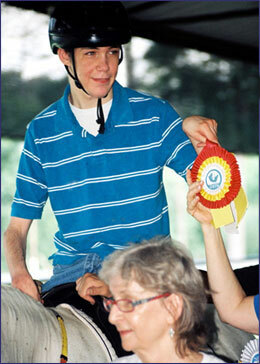 This award recognizes a Thoroughbred that has excelled in a non-competitive career, such as EAAT. The award will include a $5,000 grant to the nonprofit organization associated with the horse or, if not associated with a nonprofit organization, to a horse-related charity chosen by The Jockey Club. To apply for the T.I.P. Thoroughbred of the Year Award, please click here for the application. Applications are due June 28, 2013. PATH Intl. is seeking Membership Oversight Committee Region Representative nominations. The PATH Intl. annual nomination process for region representatives is underway. This year nominations are being accepted for odd-numbered regions: 1, 3, 5, 7, 9 and 11. PATH Intl. Region Representatives serve as ambassadors for the association and as the voice of their region's members. Responsibilities may include recruiting, retaining and recognizing members; collaborating with groups within and outside of PATH Intl. that can positively impact the success of PATH Intl. members; leading PATH Intl. recognition of center and individual members and participants; and helping coordinate states, regions and PATH Intl. communities into effective networking systems. Click here for requirements and to download the fillable nomination form or download the form from the PATH Intl. corporate documents page. Nominations are due to your current region representative no later than July 15. If you prefer, you may print the nomination form, fill it in by hand and mail it to the PATH Intl. office. All handwritten nomination forms must be received by the office by July 15 in order for the nomination to be considered. If you have any questions please contact Rachel Davis, PATH Intl. Membership Coordinator. Thank you to those nominees who are willing to contribute their time in representing the PATH Intl. members in their regions.